Jonathan Escoffery’s writing has been nominated for a Pushcart Prize and an AWP Intro Award, and his collection, If I Survive You, was a finalist for Prairie Schooner's 2016 Book Prize. 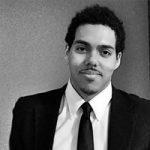 Jonathan's writing has appeared or is forthcoming in Prairie Schooner, The Caribbean Writer, Salt Hill Journal, Pangyrus, Middle Gray Magazine, and elsewhere. Jonathan earned his MFA in Fiction from the University of Minnesota. He currently resides in Boston.